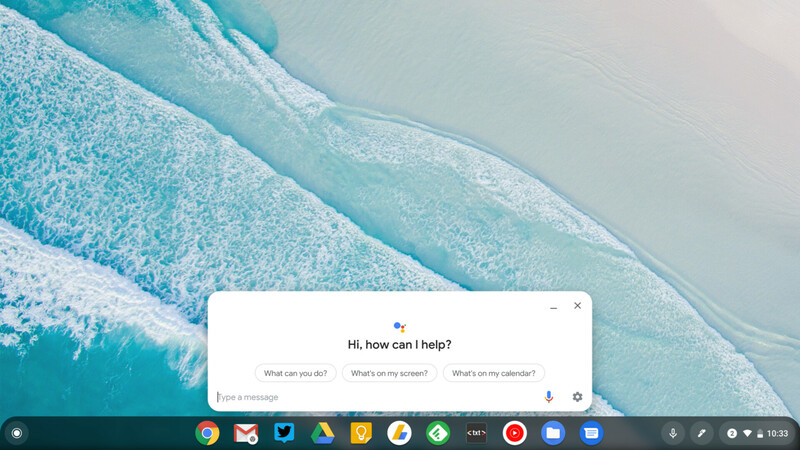 The latest stable version of Chrome OS (72) brings a considerable re-design for the Assistant interface on this platform. It also updates the version of Android used within it to 9.0 (Pie), which adds the ability to search for apps and use new Assistant settings. Chrome OS redirects Cast set-up to the Google Home app, and adds picture-in-picture video to webpages. Chrome OS has been updated to version 72. This version may be of particular interest as it changes the baked-in Android version all the way from Nougat (7.x) to Pie (9.0). It results in many more Pie-specific behaviors for the apps on this platform: for example, a user can now long-press or right-click on an icon in order to access its respective shortcuts. These shortcuts are now searchable in the Chrome OS launcher. This new version also brings improved Assistant integration to Chrome OS. The service is now featured in a dashboard, complete with cards and prompting 'chips', in the middle of the screen above the taskbar, rather than shoved into one corner as usual. As much functionality as this may bring to Chrome OS devices, the update to 72 also removes the ability to set a Cast device up in a page opened in a third-party browser. Users will now have to use the Home app to do so, although the Cast button itself will still be found in pages as normal thereafter. Its interface has been re-vamped to remove the upper blue bar and leave it with an all-white background. Chrome OS 72 also adds picture-in-picture video, but only to webpages and not apps such as YouTube. Google has also noted that the Chrome browser in 72 has been "optimized for touchscreen devices in tablet mode". The update also adds the ability to read any text that passes under the mouse cursor in ChromeVox, the platform's native screen-reader. 72 also offers external storage access for Android apps, using either MediaStore APIs or the direct /storage route. It also enhances the native printing options with options for simple, duplex, color or black & white printing. Finally, files that are saved via Backup and Sync on Google Drive are now available in the Files app (under My Drive/Computers) in Chrome OS 72.